To develop a great defensive team, players must learn correct defensive technique and understand where they should be on the court depending on who they're guarding and the position of the basketball. And the best way to accomplish this is by using proven basketball defense drills during your team practices. The goal on the defensive end of the floor is to force the opposition into taking the most difficult shot possible. This requires players to be able to play great on-ball defense and for help defense to be in the correct position and ready to rotate and help when needed. 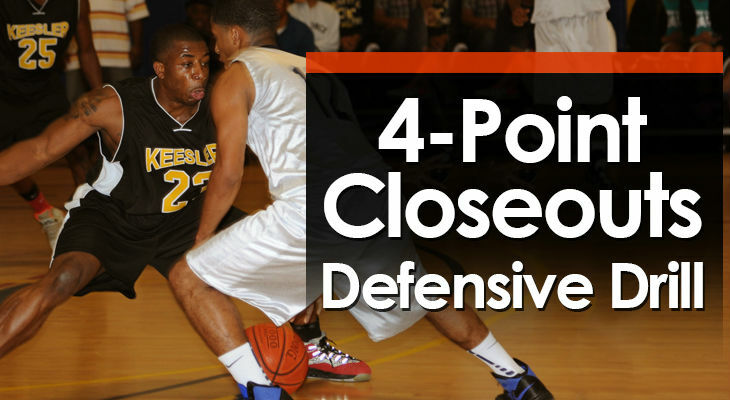 Improve closeout defense (drills 1 and 2). Improve on-ball defense (drills 1 and 5). Improve defensive technique (drills 3 and 4). Players form a line at the top of the key and fill the wing spots. An offensive and defensive player start by playing 1-on-1 from the wing. After the score or defense takes possession, the offensive player immediately closes out on the opposite wing and they play 1-on-1. 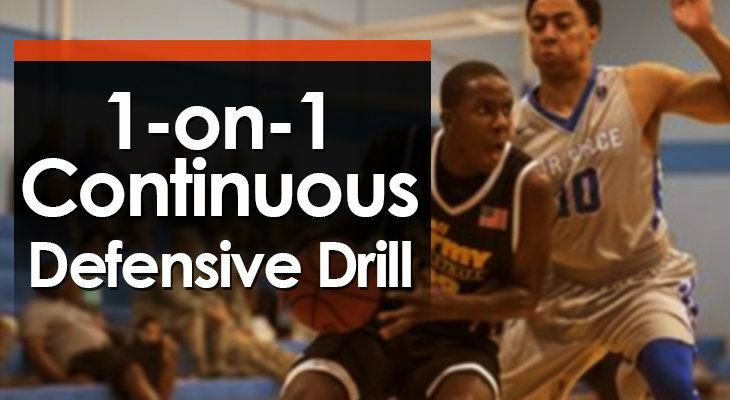 A fast-paced and competitive drill with focus on attacking the defender off a close out and being able to guard the opposition in isolation. 1-on-1 play is fantastic for development. One offensive player on each wing. One defender guarding one of the wing player. The rest of the players form a line at the top of the key each with a basketball. On the coach’s call, the offensive player being defended starts the drill by v-cutting to get open for the pass from the top and then competing 1-on-1 until a score or change of possession. As soon as they finish, the top line passes to the opposite wing and then fills the free wing. The offensive player from the previous 1-on-1 immediately closes out and they play compete until a score or change of possession. This process of the offensive player immediately transitioning to defending the opposite wing continues for the amount of time given to the drill. Wing Starts With Basketball - Instead of receiving the pass from the top and being able to attack the defense as they’re closing out, both wing players start the drill with a basketball as well. This means the offense must wait while the defender closes out until the defender touches their hip before they can attack the rim. V-Cuts to Start - In this variation the top doesn’t pass immediately to the wing. The offensive player on the wing must wait for the new defender to sprint to them and then the one-on-one starts with the offensive player getting open using a v-cut on the wing. Loser to Defense - The player that loses the one-on-one battle closes out on the next defender. This means that if the offense scores, the defender will stay on defense. 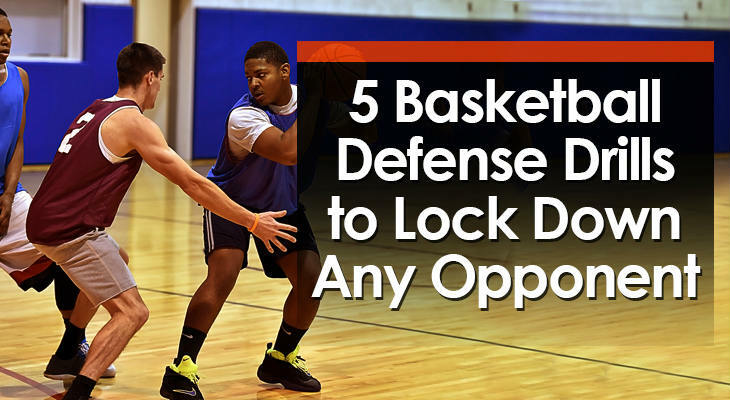 If the defense gets a stop, then the offensive player will transition to defense like usual. Limited Dribbling – Limit the dribbles the offensive player on the wing is allowed to use before taking their shot. Usually it’s best to allow 3 dribbles for youth players and 2 dribbles for advanced players. Each game of 1-on-1 can’t cross over to the opposite side of the court. This will prevent players from dribbling all over the court and ensures they’re attacking in limited space. Pay attention to the footwork of both players. Specifically the closeout for the defender and the footwork off the catch for the offensive player since many will rush and travel. The offensive player should be looking to attack immediately on the catch. This requires them to read the defender before they’ve received the basketball. For the drill to work effectively, the pass from the top to wing must be made at the right time. Too early and it gives the offense too much time. Too late and the offensive player won’t be able to attack on the catch. Defensive players start under the basket and must sprint out and close out on each of the four offensive players spread around the three-point arc. They then retreat to the basket and move on to the next player. 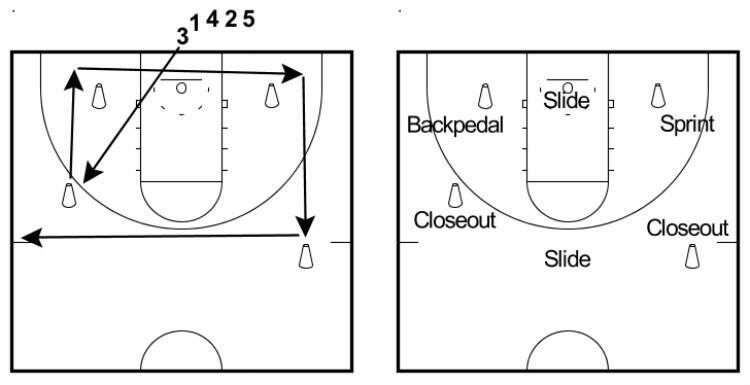 The primary purpose of this drill is to work on closeout technique. Specifically, footwork and staying on balance. 4 offensive players or coaches spread around the 3-point arc. The rest of the players underneath the basket. The 4 offensive players all have a basketball. The first player in line sprints out to the first offensive player in a clockwise direction and closes out on the ball. They then put pressure on the offensive player for 2 - 3 seconds before back-pedalling until they’re within the charge circle and then sprint out to the next player. The next player in line begins once the first player has closed out, retreated to the charge circle, and starts sprinting to the next player. After closing out to each of the 4 offensive players, the player joins the end of the line and starts again when it’s their turn. After a certain amount of time, swap the offensive players with the defensive players and continue the drill. 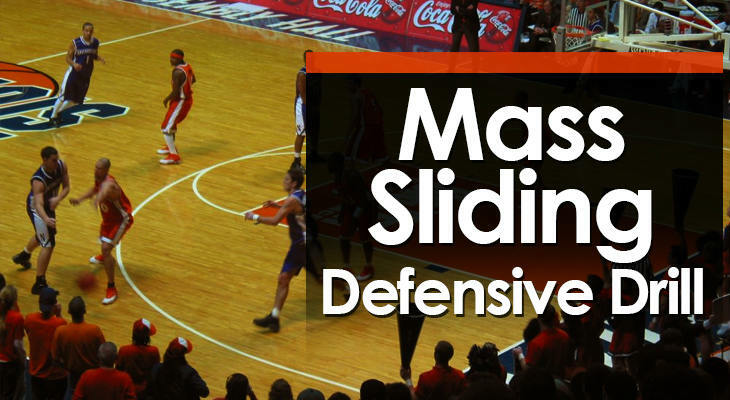 Offense Takes 1-2 Dribbles - After closing out and pressuring the basketball, the offensive player takes one to two dribbles either left or right and the defender must slide with them to stay in front. After two slides, they back-pedal to the rim. Cones Instead of Players - If all you’re doing is closing out and retreating, consider using cones to close out to instead of players. Opposite Direction - While the drill states to perform it clockwise, throughout the drill you should change the direction people are rotating at some stage. Offense must be in the triple threat stance and protecting the basketball from the defender. On the closeout, the defender should use short, choppy steps, get one hand up to contest the shot, and ensure balance to absorb the drive. When pressuring the basketball, the defender should trace the basketball with one hand and keep the other hand low to poke away a dribble. This is meant to be a conditioning drill too. Players should be sprinting and back-pedalling hard on every closeout. Make sure it’s game pace! 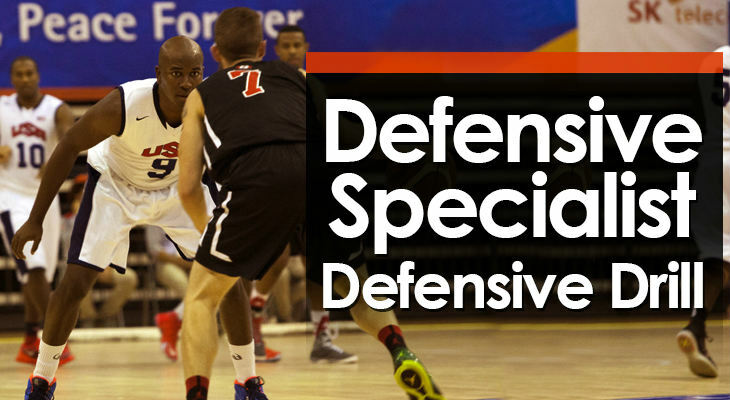 Defensive Specialist is a continuous drill that works on the different defensive movements players will make on defense including closeouts, defensive sliding, back-pedalling, and sprinting. Since this drill covers all the most frequent movements players will make on defense, it’s one of the best basketball defense drills to get them used to these different movements. Since it’s hard to explain where the cones and movements are by writing, I encourage you to take a look at the image associated with this drill for better comprehension. You will require four D-men or cones for this drill. All players begin in a straight line on the baseline. Players perform this defensive course one-by-one. The first movement is a sprint and then close out to the cone in front. The player then back-pedals around a cone directly behind them, and then slides across to the other side of the court. When the first defender slides past the line, that triggers the next player in line to start the drill. When the first defender has slid around the cone on the other side of the court, they again sprint to close out, and then once again slide to the opposite side of the court before returning to the end of the line. 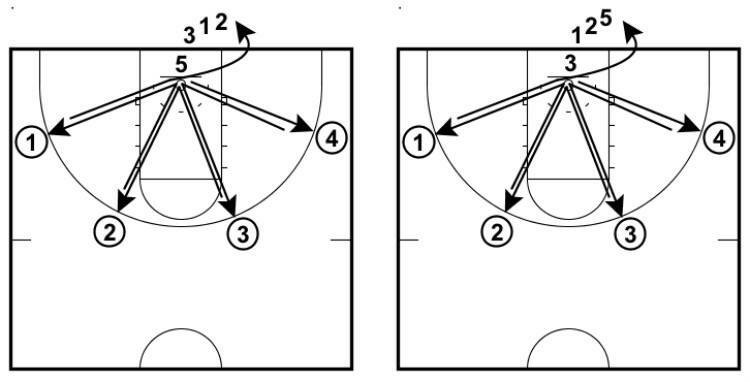 Depending on the amount of players you have, run this drill for 3 – 5 minutes. Different Course - You can easily change the course by differing the placement of the cones. Make sure to focus on the main defensive movements. ​Players must be sprinting and sliding at 100% effort throughout the entire drill. Hold the close out for a second or two before moving on. Make sure all defensive footwork is done well since this is a very important part of the drill. Players are spread out in the half or full court in a defensive stance an even distance apart from each other. A coach or another player then instructs the team to complete different defensive movements that players must follow as a collective group. A defensive drill that focuses on the fundamentals of individual defense while incorporating in conditioning. Improves defensive footwork and technique required to successfully guard a player with or without the ball. Players are spread out in the half or full court depending on how many players are used. Players must have enough space between each other. The coach stands out front of the group to be seen clearly at all times by all of the players. The drill begins with all players down in a low stance and ‘pitter-pattering’ their feet (quick feet). The coach then uses both visual and verbal cues to instruct players’ to perform defensive movements. This continues for a usually 2 - 3 minutes. Lateral slides east and west - Point the direction you want them to slide. Drop step slides - Point diagonally behind them. Players must drop step and then slide that direction. Close-Outs - Point hands in the air. Players sprint 2 - 3 steps forward and then close-out with high hands while keeping a low base. Charge - Cross arms at chest. Players fall backwards simulating taking a charge and then get straight back up into pitter patter. Rebound - Jump up with two hands. On the rebound call, players must jump up and down three times as high as they can simulating getting a defensive rebound. Back-Pedal - Pointing behind the players. Players behind must communicate with the player in front of them. Sprint - Motion forward with hands. Players must sprint forward to their starting position. ​Players must remain in a low and wide defensive stance during the entire drill. Pay attention on correct footwork and good balance. Players shouldn’t be leaning forward when in defensive stance. Arms must be out to the sides throughout the entire drill. Get used to doing it for games. Encourage players to be loud on close-outs, charge calls, when back-pedalling, etc. Can be a great drill to use when you’ve got a large group of players. The coach must be enthusiastic while leading the players through the drill. They’re not going to be enthusiastic if you’re not. Two players compete 1-on-1 from the wing. The goal for the defense is to prevent the pass to the wing player while the offensive player attempts to make 3 catches in a row. 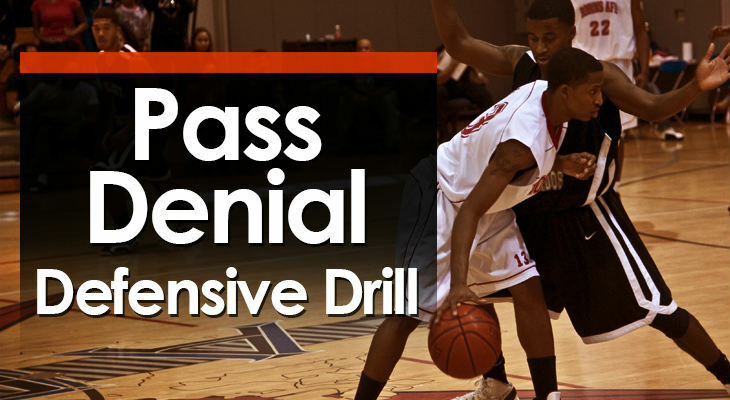 Being able to deny the pass to your opponent is one of the most important skills in a traditional man-to-man defense. This drill allows players to practice their positioning and being able to react to the movements of the offensive player. One player with a basketball on the strong-side slot position. One offensive player on the wing. One defensive player on the wing guarding the offensive player. The drill starts with the offensive player walking the defender in and exploding out looking to receive the pass from the player in the slot. The defense attempts to constantly deny the pass to the offensive player on the wing. The offensive player can perform a v-cuts and utilise changes of speed but must stay on the line between the wing and the basket. Each time the offensive player catches the basketball, they immediately pass back to the player in the slot and the drill continues. After the third catch, the players swap positions. Live 1-on-1 – After the pass is made, you can allow the players to play one-on-one until a score or a missed shot. The offensive player has a maximum of 2 - 3 dribbles before shooting. Different Spots on the Floor - The drill can also be run making a pass from the wing to the corner or from the wing to the top of the key. Both Sides of the Floor - Since there are only 3 players involved at one time in the drill, run it on both sides of the court and also at the opposite end of the court if you have enough players. When in denial position, the defender should have their chest facing the offensive player and have their arm out looking over their shoulder. This allows them to quickly prevent a backdoor pass instead of having to make a 180 degree turn. The offensive player can receive the backdoor pass for the layup if the defender is overplaying them. The defender should maintain contact with their arm-bar throughout the drill. Warn players that if they extend their arm-bar and push, it will be a foul. The offensive players should practice getting open by establishing a higher foot than the defender and then exploding out to the wing. This is one of the most important basketball defense drills as most offenses start with a top to wing pass. If your players are good at defending it, it will take a lot of teams out of their offense and confuse them!